A gritty antidote to the early Bond films, this spy thriller pits Michael Caine against some brainwashing Albanians who spend their time hanging around the Royal Albert Hall studying, listening to marching music, and killing Her Majesty's secret agents. 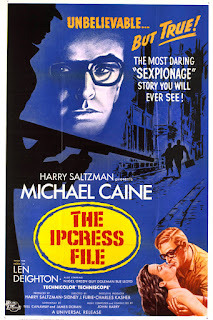 Fond of fistfights and 'birds,' we're meant to think Caine is unlike Bond because he's working class. Nonsense! With a West End flat and a penchant for extreme violence and freshly-ground coffee peculiar for the mid-1960s, the character borrows various inclinations from Ian Fleming's novelistic mouchard. Caine plays the role brilliantly, but the rest of the cast (Gordon Jackson excepted) are forgettable. And then there's the contrived camerawork - filming from wonky angles, and scenes shot from under someone's elbow or through a telephone box. It's meant to be swinging and countercultural I suppose, but it just looks contrived. There's an uncanny confrontation in a library. Caine sits across from the Albanian malin génie. At a volume unsuited to the location, asks his nemesis awkward questions. Though no-one gives them a second glance, Bluejay (the baddie) tells Caine to shush. The scene was filmed in the old Science Museum Library in the Royal College of Science building, now part of Imperial College.